You are amidst your search for a job and after many applying for various companies waiting for your call. Sometimes you would have attended interview call but the employer would not have given you a positive reply. You are waiting for the next call or looking out for another vacancy. This search and waiting would create a sort of depression or frustration in due course of time. This is very much prominent in people who are the sole bread winner for the family. The level of frustration leads a person to alcoholism and /or drug abuse to get away from the worry. 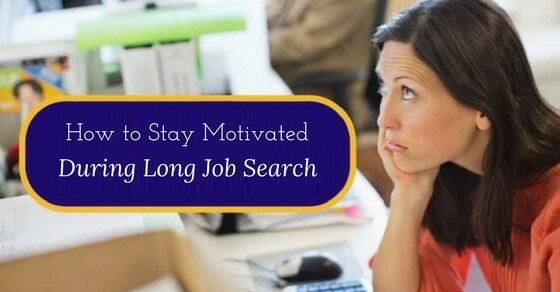 But it is up to the individual to stay motivated throughout the journey of job search. What could be the ways to keep oneself motivated? You need to understand about the ‘real’ world of employment and its details. Not all applications will be called for and not all interviews successful. This is reality and you need to accept this fact in your mind. Once this is done then you would not get frustrated or depressed. Review the market and trends that is changing and update yourself regularly. Have you been rejected from the first interview call? Don’t worry, this is not the end of the cycle. Of course, it is tough to cope up with rejection. Thinking about it and brooding over the rejection will make you even gloomy and hinder you from moving ahead or taking the next step. You just need to side-line the aspect and carry on with your next task. Brush it aside as it is not personal and you would definitely learn from this as to how you could do better. You had been called for interview but to your amazement you find that someone else was selected. Don’t get disheartened. Why don’t you look at another perspective? You have been writing to many companies and have attended many interviews. It’s the experience of handling questions from interview or being able to write applications or the cover letter that should be regarded as most important. This experience cannot be got in a classroom or training session. It’s ‘your’ experience to handle the situation which is unique. All experiences should be considered as opportunity to learn. By considering each step of experience that made you a better person will definitely motivate you. Further you need to review your profile or covering letter or interview process and find out what was lacking. Ask yourself how you could improve it. Try to overcome them by learning from those mistakes. By seeing rejection mail on mail box, don’t hesitate to call them and ask what about their feedback. This is to avoid the same errors in the future. Often you may get exhausted after each interview. You would be excited entering the venue and slowly your enthusiasm goes down after each session. At the end of the day try to revitalize yourself or recharge yourself by doing things you love to. It could be doing volunteering work, charity or spending time at home with your friends or family. Each activity has its own advantage. Participating in them can be added to your credit. Hence, try to allocate a specific time of the day for searching and filling applications. Spend the remaining part of the day for recharging yourself so that you are fresh for the next day. Having to experience many interviews is not an easy task. Every application or every interview needs a lot of preparation and time. Involving in each aspect of the process helps you to learn the details. Moreover, having to attend an interview brings out the attitude towards others. Whether you come out with a thumbs up or not, congratulate yourself for making it through to this level. You could treat yourself to an ice cream or coffee with a friend or dinner with your parents. A small motivation to boost you. Most of us always like to share our inner most feelings about the incident to someone in the family or a close friend. Make yourself to share your experiences with your family member like your wife or husband or father or sister. This venting out frustration or any bad feelings will make you feel light inside. Also the thoughts that were making you feel gloomy will be overshadowed and make you feel fresh for the next work. Your parents or friends are your mentors also. Pay attention to their advises which they have to share from their experiences. Most of the time they are ones to give you constructive criticism. Take it lightly and change accordingly. There are many opportunities that might arise from networking. Involve in socializing with friends who are employed to not only share but also get to know about other opportunities. It is also a way to make improvements in yourself. Through them you would get help in modifying your application including the covering letter to suit to the post applied for. There are many ways to expose yourself to the world outside. It could be books, magazines, TV, movies, etc. Each of them provide a way to refresh your mind and bring you out of the negativity. By exposing or seeing them you would see the other side of life as well and say to yourself that the world is not a bad place after all. Get yourself a book on the autobiography of people who have been successful. Reading their ups and downs will motivate you on how to handle life’s challenges. They too would not have come out successful within a day. It would have taken days and years to reach to that level. By getting to read about them you would be able to know how they got through failures and setbacks that they faced. After a specific time, you would need to revise your strategy to go about your process of job search. Maybe you need to contact 2 or 3 professional personnel to carry out informational interviews. This would help to decide whether to modify the information or your profile. A great amount of information will be helpful to understand the market needs as well and modify your job search itself. Through that process you would make amendments to your resume itself. Sometimes you would have noticed that by using the particular style of resume format the chances were less or employers are not noticing your skills. Instead try to revise your resume format from traditional style to functional style to catch the eye. Such resume formats mostly focus on the functions as the initial paragraph is a summary of the skills and experiences in a nutshell. This way you would get noticed and bring you out of disappointments. You could try this out to move you out of monotonous way of presenting yourself. Having gone through interviews, you would have been seeing the type of questions asked. You could use this as an opportunity to review those points and use the internet to gather more details on how to present yourself. By opening yourself up you could come out of the negativity. Take this opportunity to make yourself understand the various techniques you will need to plan for interview. By this time you would be in position to get to know recruiters whom you can trust. They will help you to modify your resume, prepare for interviews and even help you tackle tests or presentation. Such relations will be helping to motivate you and focus on your strengths. A very important aspect for everyone is to be patient and keep pursuing. There could be a time when it is favourable or it might take time. Even employers do take time to get their right candidate. Hence, don’t give up after a set of interviews. Think positively about your next application and expect interview call. If you miss your bus to your destination there is always another one on the way. So don’t leave your bus stop!! The job search is not only depending solely on the market economy but in the employer’s hands as well. Their internal financial needs determines their needs for human resources. Some even want to manage the functions by merging roles with a little increment to the employee to avoid further recruitment costs. But nevertheless, a recruitment does take place to fill up the place. Keeping a job or looking out for new one involves motivation within oneself. You may never know when the tide will turn in your favour. Managing the situation and how to go about your day is all that is needed. You would have seen that most of the time networking and family are the main sources of your inspiration. Keep yourself motivated by learning from your experiences as each time you are exposing to new. Next articleCan Employers Sue an Employee for Breach of Contract?